Prime Minister Manmohan Singh’s olive branch to agitated corporate leaders, emphasizing that while powers to tap telephones were needed in the world that we live in, they have to be exercised with utmost care and under well defined rules so that they are not misused, has come not a day too soon. His instruction to cabinet secretary KM Chandrashekhar to look into all aspects of phone tapping by governmental agencies and to report back to the Cabinet within a month is well-meaning. Justice K.G. Balakrishnan, former Chief Justice of India and currently the Chairperson of the National Human Rights Commission, is in a tight spot following Supreme Court Judge H.L. Gokhale’s statement about the controversy over Madras High Court Judge K. Reghupati’s complaint against former Union Telecommunications Minister A. Raja. Putting the record straight on Tuesday, Justice Gokhale has clarified that when he was the Madras High Court Chief Justice, he had forwarded his fellow judge Justice Reghupati’s letter to former CJI Justice Balakrishnan for appropriate action. Raising oil prices is an economic necessity but also politically damaging for the ruling UPA. The government , it seems, has waited for Parliament’s non-session to be over before letting the oil retailing companies to go ahead with the price increases. Since the petrol decontrol in June this year it is the oil marketing companies that decide on price hikes. The latest increase of about Rs 3 a litre is the steepest since June and is justified on the ground that the global crude prices have risen to $90 a barrel. The controversy over J&K Chief Minister Omar Abdullah’s statement on the state’s accession to the Indian Union was revived over a month after it was made, as the BJP and some allied parties organised a bandh in Jammu in protest against it on November 8 when the Durbar — the government offices — moved to Jammu, the winter capital. The momentum of the protest has further been raised. The party is holding demonstrations at various places where effigies of the Chief Minister are burnt. Some national leaders of the BJP have joined these protests. I come from a place where for the middle classes, drinking is a guilty pleasure that they indulge in only occasionally. Men would slip into some dimly lit room on occasions like weddings, take a swig or two, rush out and go about their business as usual. There has been much disinformation put out in India about the 1971 operations. My book — Surrender at Dacca — was published in 1997 and copies were given to Field Marshal Sam Manekshaw and Lt Gen J.S. Aurora in 1997. There were no rejoinders. The book has been translated into Chinese, Thai, Persian, Arabic, Bengali, Marathi and Hebrew and is taught in military institutions and some universities across the world. When will we honour our soldiers? Today is the 39th anniversary of the greatest victory India has won, not just since Independence but also in the last hundreds of years. 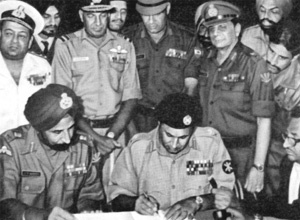 It was on this day in 1971 that the Indian Military won resounding victories in all theatres of that war, with the crowning glory being the capture of East Pakistan; the birth of Bangladesh; and taking more than 93,000 Pakistani soldiers as prisoners of war. It is on this date that the victory is celebrated as Vijay Diwas, but sadly only by our armed forces. Prime Minister Manmohan Singh’s olive branch to agitated corporate leaders, emphasizing that while powers to tap telephones were needed in the world that we live in, they have to be exercised with utmost care and under well defined rules so that they are not misused, has come not a day too soon. His instruction to cabinet secretary KM Chandrashekhar to look into all aspects of phone tapping by governmental agencies and to report back to the Cabinet within a month is well-meaning. That the manner in which as many as 5,800 phone conversations from August 20, 2008, and July 9, 2009, between corporate lobbyist Niira Radia (who is currently being probed for her role in the 2G spectrum allocation scam) and a number of politicians, industrialists and media personalities were recorded by the Directorate-General of Income Tax on charges of tax violations by Radia has not gone down well with corporates as a whole stands to reason. What has exacerbated the situation is the systematic leaks of some conversations. The point at issue, therefore, is not just whether the IT Department exceeded its brief by tapping Radia’s telephone for nearly two years but also whether there was a sinister motive in leaking some conversation transcripts to the media. While there can be little doubt that the misuse of phone tapping needs to be stopped so that the privacy of the individual is protected except when national security is at stake or when tax evasion and money laundering are an issue, the question of “perceived ethical deficit” that the Prime Minister talked about in his address to business leaders is also pertinent. It is all very well to cry ‘wolf’ as some business leaders are doing, but industry too needs to introspect on its questionable business practices. It is not the responsibility of the media to keep documents under wraps if they throw light on murky goings-on between lobbyists on the one hand and politicians, bureaucrats and business on the other. However, there is a case for restraining the sensation-mongering that is fast becoming the daily diet of sections of the media. All in all, there is merit in industrialist Ratan Tata’s well-meaning comment that if the government ‘leaks’ as it has on the Radia tapes, we risk turning into a banana republic. Justice K.G. Balakrishnan, former Chief Justice of India and currently the Chairperson of the National Human Rights Commission, is in a tight spot following Supreme Court Judge H.L. Gokhale’s statement about the controversy over Madras High Court Judge K. Reghupati’s complaint against former Union Telecommunications Minister A. Raja. Putting the record straight on Tuesday, Justice Gokhale has clarified that when he was the Madras High Court Chief Justice, he had forwarded his fellow judge Justice Reghupati’s letter to former CJI Justice Balakrishnan for appropriate action. In a complaint, Justice Reghupati had said that Mr Raja had tried to “influence” him through Mr Chandramohan, an advocate. The latter is said to have barged into Justice Reghupati’s chamber and asked him to consider favourably two persons, accused in a criminal case, who were said to be Mr Raja’s “family friends”. Creditably, Justice Reghupati refused to speak to Mr Raja though Mr Chandramohan had handed over the mobile phone to him. “My stand has been vindicated”, Justice Reghupati said soon after Justice Gokhale’s clarification. Surprisingly, Justice Balakrishnan’s response to Justice Gokhale’s statement has been evasive and unconvincing so far. The latter has, certainly, “punched a hole” in the former’s version of December 8 when he said that Justice Gokhale’s letter did not name any Union Minister having tried to talk to Justice Reghupati over the phone. While Justice Balakrishnan has reiterated on Wednesday that no minister’s name has been mentioned in the report sent to him, he is keeping mum on the second paragraph of Justice Reghupati’s letter (clearly mentioning Mr Raja’s name) which Justice Gokhale had promptly forwarded to him. As it is a High Court Judge’s complaint against a former Union Minister who tried to influence him and subvert the criminal justice system, the people have the fundamental right to know the truth so that all those found guilty are brought to book quickly. On his part, Justice Balakrishnan will have to come clean on the issue particularly because he was the CJI and now heads an institution like the NHRC. If Justice Gokhale’s statement is true, Justice Balakrishnan needs to tell the nation why he did not bring the matter to the President’s attention. Had he done so promptly in July last year, the President would have forwarded the matter to the Prime Minister for suitable action against Mr Raja. In the context of increasing reports of corruption in high places, the latest controversy is bound to affect the fair image and reputation of the judiciary. For diesel, kerosene and cooking gas any decision on price rise is cleared by the Union Cabinet. Media reports indicate that a Rs 2 per litre hike for diesel is on the cards and a formal decision will be taken by the Cabinet next week. Costlier diesel will hurt farmers, transporters and manufacturers — in fact, the economy in general. It will push up prices of essential commodities and defeat the efforts of the government and the RBI to bring down inflation within the comfort zone of 5 per cent by March next year. Although inflation has declined to an 11-month low of 7.48 per cent this November largely because of the base effect, the oil price hike and its consequent effect on inflation may force the RBI, which is reviewing its monetary policy on Thursday, to take a hard line. The government will suffer a loss of Rs 65,00 crore in the current fiscal year for selling oil below cost. The state-owned companies lose Rs 4.17 a litre on petrol and Rs 4.17 a litre on diesel. The government subsidises the loss-making firms in the broader public interest. India meets 70 per cent of its energy needs through imported oil. The opposition parties understand the economic logic behind the oil price hike but do not want to let go any opportunity to draw political mileage and further embarrass an already beleaguered government. The controversy over J&K Chief Minister Omar Abdullah’s statement on the state’s accession to the Indian Union was revived over a month after it was made, as the BJP and some allied parties organised a bandh in Jammu in protest against it on November 8 when the Durbar — the government offices — moved to Jammu, the winter capital. The momentum of the protest has further been raised. The party is holding demonstrations at various places where effigies of the Chief Minister are burnt. Some national leaders of the BJP have joined these protests. The party proposes to raise the issue in Parliament and organize a bigger protest rally in Jammu, where its senior national leaders are expected to be present. The party has demanded an apology from the Chief Minister, who instead has reiterated his statement. On October 6, the Chief Minister in his 90-minute speech in the State Legislative Assembly had said, “Accession of the state to India has occurred under an agreement. We have not broken that agreement, but you have gradually demolished it and people are aggrieved and angry for your act.” He further drew a distinction between the accession of the state and that of other states which, unlike J&K, had merged. The statement was hailed in separatist circles. Syed Ali Shah Geelani said, “Omar’s stand is not only the vindication but also victory of the conglomerate’s (Hurriyat’s) stand.” On the contrary, the statement has shaken the pro-India elements. The BJP has made it a national issue. In fact, it is not so much an issue of views as of facts. The fact is that accession has no degrees. It is either accession or secession. The slogan raised by the Jan Sangh in 1953 for full accession and now by the BJP had no meaning. The controversy over full and limited accession had made the fact of accession a matter of controversy. Similarly, it is simply not true that the accession of J&K to the Indian Union was under different conditions than those prevailing in other states. All princely states acceded to the Indian Union on the same terms and all rulers signed the same instrument of accession. There was no separate agreement with the J&K state as contended by the Chief Minister, unless he meant the promise of a plebiscite. But that was subject to many conditions which are a subject of dispute between India and Pakistan. The National Conference no longer insists on it. What other agreement does Omar refer to under which the accession was made? Originally the Constitution of India had divided the country into three parts: (A) The erstwhile provinces in the British regime, (B) the princely states, and (C) the states directly ruled by the Centre. After some time, changes took place in the Constitution. Some states merged together as Patiala and some adjoining states called Pepsu. The institution of princes, too, was abolished in all states as it was done in Jammu and Kashmir. The others merged with the neighbouring states at the time of reorganisation on the basis of their linguistic affinity. Most of the states opted for a status equal to the part “A” states under popular pressure, mobilised by the Praja Mandals, counterparts of the Congress in the princely states. Thus, the provision for the “B” states in the Constitution was abolished. In the case of Jammu and Kashmir, no major changes took place till 1964 when the head of state continued to be called Sadar-i-Riyasat and the head of government as Prime Minister. In the post-Nehru period, major changes took place in the constitutional relations of the state with the Union against the popular sentiment in the valley when its most prominent leader, Sheikh Abdullah, was in jail. So far as Chief Minister Omar Abdullah’s distinction between accession and merger is concerned, there seems to be some confusion, as no state of the country has fully merged into the Union of India and every state has some amount of autonomy. In fact, in a federal country, no state is fully merged. There has been the demand in the states like Tamil Nadu, Punjab, West Bengal and those in the Northeast for more autonomy, and the case of Jammu & Kashmir is no different from these states. In the same states, the demand for autonomy took a more aggressive form. In Punjab, it was taken over by terrorists, who demanded secession while in Tamil Nadu the Indian flag and the Constitution were burnt in the early years of Independence. In the Northeast, a violent movement is still going on. Gradually, the Indian federal system was able to satisfy the aspirations of most of the states excepting the Northeast and J&K. The powers of the states expanded partly because opposition parties were elected to form the government in many states and partly because of a liberal interpretation of the Constitution by the Supreme Court. Earlier the Centre could dismiss any state government and impose Governor’s rule, who represented the President and worked under the direction of the Union Government. Now no elected state government can be dismissed arbitrarily by the Union government as long as it is working according to the provisions of the Constitution. In J&K, as long as the state government was run by a party different from that in power at the Centre — the National Conference in J & K and the Janata Party and the Congress at the Centre from 1975 to 1986 — the people of Kashmir enjoyed a greater degree of autonomy and there was no sense of alienation among them. However, now partly on account of regional tensions, internationalisation of the issue by Pakistan and partly due to the follies of the Central government, discontent was revived and continues to be there in the Kashmir valley. Basically, the National Conference wants more autonomy as agreed upon by Pandit Nehru and Sheikh Abdullah in 1952, which can be considered. But the apprehensions of Jammu and Ladakh regions about it cannot be dismissed. The first step, therefore, should be to reconcile the aspirations of all the regions which the 1952 agreement had taken care of. For, this also included a provision for regional autonomy. It is within the jurisdiction of the state assembly to grant regional autonomy. It is the responsibility of the government and the political parties of the state to decide the exact form of regional autonomy. If regional aspirations are satisfied, it would be much easier to work out a consensus over the form of autonomy in the state or any status that the leaders of Kashmir aspire for. For good boys and responsible men, there is nothing like a booze party in Bihar. The early enquiries a girl’s family makes about the prospective groom inevitably include “does he drink?” and the answer, if the responder is sympathetic to the boy’s family, is often laced with a touch of outrage. “Kya baat karte hain (How dare you ask)? He is such a nice chap”. It doesn’t mean, though, they don’t drink; only that they would not accept it. So when I landed in Chandigarh, as liberal as an Indian city could be, I thought the circle was complete. Nightly drinks were never an issue and a mug of beer or a shot of vodka during the day was perfectly fine. If you were meeting somebody in the evening at his home, you were often offered a drink and even pakka sufis (non-drinkers) kept bottles handy to serve others. In Srinagar, where I spent close to three years, the one thing I missed most was Chandigarh’s get-togethers and that drunken camaraderie which is born between the pegs and dies as soon as you get hold of your senses. In those enlightened moments, you can share your “frank opinions” with your boss about the organisation’s policies and him as well and be sure that your sins, if indeed, would be duly pardoned. My mother may not love me for this but I visited Chandigarh more than my home to relive those moments and take a much-needed break from a place where the spotting of liquor bottles on the streets would send the puritan brigade into a moralistic rage. There would be frequent stories about the travails of residents living close to a couple of liquor shops in the city. The young generation was being led astray, they would lament piously. I had come to the conclusion that the City Beautiful was the best place to be tipsy because of its openness and not the least because liquor is so cheap compared to other places. It seems I am still learning. I went to attend a wedding at a place near Manali recently and was straightaway led to a room where close to 20 persons had been drinking for the past two days. My shocked expression was met with a matter-of-fact reply. “We do take breaks to eat and those feeling sleepy could take a nap. One can drink slowly if he wishes but your glass should not be empty,” I was told. I learnt that the party went on for two more days. I have no bones to pick with the moral brigade. But I do have realised one thing. A society which is at ease with its warts is a better place to live in. n	Very critical of the role of Pakistani military and politicians. n	Pakistani Army carried out senseless killings of intellectuals, professionals, industrialists and Bengali officers. n	Pakistani generals surrendered prematurely. The military’s continued involvement in running the government was one reason for corruption and ineffectiveness of senior officers. n	Corruption resulting from such involvement, lust for wine and women and greed for land and houses resulted in serior officers losing their professional competence and the will to fight. n	Recommended Gen Yahya Khan, Pakistan’s then military ruler and 11 other generals, including Lt Gen A.A.K. Niazi, be tried publicly. The report recommended a string of courts-martial against top military officers. Pakistan’s commander in the east, Lt Gen A.A.K. Niazi, had sent a cease fire proposal that specified a withdrawal of the armed forces, para-military and ethnic minorities under the UN along with handing over of the government to this this international body. No war crime trials were to be held. There was no mention at all of India in his proposals. The ceasefire proposals were rejected outright by Z.A. Bhutto in New York, where he was to attend a meeting of the UN Security Council. Bhutto tore up the resolution vowing to fight on. A ceasefire was announced by India on December 15. On the morning of December 16, Manekshaw asked me get a “surrender”. The UN Security Council was in session. I had sent a draft Instrument of Surrender to Manekshaw some days earlier, which the latter declined to confirm. I took this draft that I had earlier sent to Delhi with me to Dacca (now Dhaka). At Dacca I was met by representatives of the UN, Marc Henry and Kelly, who asked me to accompany them to take over the government. Fighting was still on in Dacca between the Mukti Bahini forces and the Pakistani Army. I thanked them but regretted their offer and proceeded in a Pakistan Army staff car accompanied by a Pakistani brigadier. A few hundred yards down the road the Mukti Bahini fired at the car. I was unhurt. They had wanted to kill the brigadier, but I persuaded the Mukti Bahini to let us proceed. I negotiated the surrender with Niazi at his headquarters. On the draft Instrument of Surrender that I had earlier sent to Delhi but still remained unconfirmed, in a span of about four hours, a ceasefire proposed under the auspices of the UN was converted into an unconditional public surrender of 93,000 troops. This was the only public surrender in the history of modern warfare. The German Field Marshal, Von Paulus surrendered at Stalingrad with 90,000 troops during the Second World War. Niazi replied : 'I was compelled to do so by General Jacob who blackmailed me into surrendering,…. etc., etc." This he has repeated in his book, Betrayal of East Pakistan. Suppose I had failed to convert Niazi's proposed cease fire under the auspices of the UN into an unconditional public surrender of 93,000 Pakistani soldiers, the UN would have ordered a withdrawal the next day and taken over the administration of East Pakistan. I did not fail. A new nation — Bangladesh — was born. And India became a regional super power. Due credit for the victory must go to our officers and men who fought so gallantly. About 1,400 were killed and 4,000 wounded. Let us not forget their sacrifice. 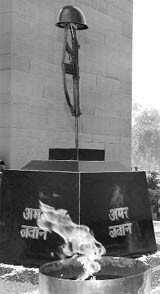 The rifle and helmet placed at Amar Jawan Jyoti on Rajpath in New Delhi have been recovered from the battlefield at Jessore. These once belonged to an unknown soldier who played an incognito yet an indispensable part in history. Situated in south-western Bangladesh, Jessore was the first district to be liberated from Pakistan on December 7, 1971. On this day, in military stations, onboard ships and at airbases, military personnel remember the officers and jawans who had fought wars for the nation, some sacrificing themselves and others their limbs. It is a day of rejoicing and jubilation, as also of reflection and remembrance. Yet only 1.3 million souls who don the uniform, nearly three million veterans and their families commemorate this important day. The rest, comprising over a billion Indians, are not even aware of it, thanks to the government that has no time to even commend the soldiers for their sacrifices. What a monumental shame! Most European and Commonwealth countries, celebrate November 11 as Remembrance Day, while in the US it is Veterans Day. On November 11, 1918, an armistice (truce) was signed that ended World War I. On this day these countries honour their men and women in uniform. Grateful nations, led by the governing elite, recall the gallantry, sacrifices and the selfless spirit of their soldiers. Similarly, most nations have days or weeks earmarked for felicitating their soldiers and veterans. All military personnel who had fought, died and lost limbs in wars and battles for their nations are honoured. It is a treat to see how proudly nations place their military men and women on pedestals, recall their exploits and honour them. There are parades with heads of states presiding, where the populace cheer and express their gratitude for the soldiers of yore. There are memorial services; visits to the sites where great battles were fought; escorted tours for the veterans still living, where much is made of them; and speeches extolling the bravery of soldiers and how the nation is beholden to them. What do we do in India? Practically nothing, because our leaders are not bothered with such niceties as honour, sacrifice and national pride as it distracts them from their favourite pastimes, which are too well known to be reiterated. The Commander-in-Chief of our republic, the President, remains ensconced in the hallowed precincts of Rashtrapati Bhawan, instead of meeting a selection of military personnel at an "At Home"; the Prime Minister does not visit jawans guarding our inhospitable borders, or meets and discuss the problems of the war disabled; and governors and chief ministers do not even know it is a special day for the nation, not just for the military. A few years ago, political leaders stooped to the lowest levels possible when they dubbed the two recent wars as the "Congress War" and the "BJP War"! Then there are the bureaucrats, the intimate advisors to political leaders. They are past masters at ignoring or playing down sentiments and coming up with ingenious arguments as to why there is nothing to celebrate! At one stage, they stated that any such celebration may upset the dialogue we were then having with Pakistan. They also had the temerity to question the need to celebrate something that happened decades back! On Vijay Diwas, the defence minister makes an appearance at the Amar Jawan Jyoti at India Gate to lay a wreath. He does so oblivious of the fact that he is laying a wreath at a place constructed by the British when India was a colony. He does not even feel the incongruity of having no war memorial for soldiers who have made sacrifices in the wars fought bitterly in the post-Independence era, even after six decades of Independence. What a monumental shame! After Independence the government decided that instead of following the Commonwealth, India will have its own day for commending soldiers. On August 28, 1949, a committee chose December 7 and christened it as the Armed Forces Flag Day. However, the significance of the day, viz. "commemorating the sacrifices of the soldiers" was soon forgotten. It became just a day for collecting funds, ostensibly for the welfare of the soldiers. The status today is that state governments are unable to collect even the small targets laid down and the bulk of the funds are contributed by soldiers, seemingly for their own welfare! How ironical in an era when nine percent rate of growth of the GDP is announced with much fanfare every other day. Is the nation still in penury that collections are needed to provide some welfare to the soldiers? Over six years ago, a Department of Ex-Servicemen Welfare (ESW) was created to give focused attention to welfare programmes for ex-servicemen and their dependants. In reality it was a cosmetic exercise as three existing entities of the Ministry of Defence merely started reporting to another set of bureaucrats. Even after six years, except for garnering additional vacancies for their cadre, the department is yet to come out with a single programme for the welfare of veterans. They also commenced looking after the pensions of veterans and the mess they have made post--Sixth Pay Commission is too well known. Here is a department tailor-made to make much of the soldiers' sacrifices by conceiving a comprehensive and long-term plan to commemorate their valiant deeds, not only on Vijay Diwas, but also on other such occasions. The need is for vision, empathy and dedication, which requires staffing this department by military personnel. They know what soldiers want and how best to meet their needs. The incongruity of welfare of soldiers by the bureaucracy needs immediate burial. Let us do so without delay and start honouring our soldiers.